I love St. Patrick’s Day. I’m obviously not Irish – nor is anybody in my family. Nada. Nobody. But I still love it because St. Patrick’s Day is the time when all of my rainbow creations come to life. There’s something about colorful treats that make me happy. Maybe it’s the vivid, cartoon-like colors, or maybe it’s just that rainbows remind me of sunshine in the middle of a long New England winter. These Rainbow Cake Pops are my latest rainbow treat. I love this particular version of Rainbow Cake pops because they’re rainbow on the outside and the inside! The rainbow on the outside of the cake pop was incredibly easy. I just dipped the entire cake pop into some light blue candy coating, and the rainbow is made with mini-M&M’s. Too bad they don’t make a purple mini-M&M’s, but even without the purple, it still looks close enough to a rainbow. The clouds at either end of the rainbow are just piped vanilla frosting. The rainbow on the inside isn’t much more complicated, but it definitely requires more steps. It starts out with batter for a dozen vanilla cupcakes. I used the recipe below, but you could also use a boxed mix. Then I divided the raw batter equally between 6 bowls. I used AmeriColor gel food color to tint each bowl with one color of the rainbow. You can find gel food color at your local craft store, or you could use regular food color from the grocery store. In the end, you should have 2 cupcakes for each color of the rainbow. Once the cupcakes are baked and cooled, using 6 separate bowls, I crumbled the cupcakes, separating them by color. (The red ones were crumbled in a bowl, the orange ones in another, etc.) In each of the cupcake-crumb bowls, I added about 2 tbs of vanilla frosting to turn the crumbs into a clay-like texture. Finally, to assemble the rainbow cake balls, I took a pinch of each color and rolled it into one cohesive cake ball. To ensure that the colors stay separate, you cannot smoosh and re-roll the ball. It’s sort of a one-shot deal. The good news is that it’s really tough to mess up, and every single one looks pretty fantastic. Then it’s off to dipping the Rainbow Cake Pops. I didn’t want to put the cake pops on sticks, so I just used a toothpick to dip them into the candy melts. When the coating is still wet, apply the mini-M&M’s. And ta-da: Rainbow Cake Pops with a rainbow on the outside and the inside. 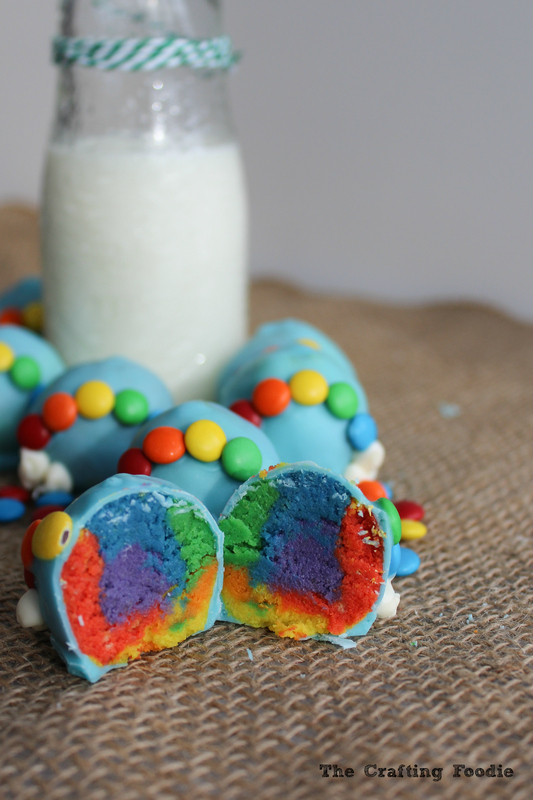 These cake pops moist and delicious, plus they're the perfect rainbow treat. The cake pops are decorated with rainbows on the outside, and the cake itself is also rainbow colored! They're perfect for St. Patrick's Day or any rainbow themed party. Line a standard cupcake tin with paper liners and set aside. In a small bowl, whisk together the the eggs, sour cream, oil, and vanilla extract until smooth. In the bowl of a mixer fitted with a paddle attachment, mix together the cake flour, baking powder, baking soda, and salt. On low speed, add the butter. Mix on medium-low speed for about 2 minutes. The end result should be a fine crumb mixture. Add the egg mixture to the flour mixture. Beat on medium speed until just combined. Add the milk and mix until just combined. The mixture will be quite thin. Divide the batter equally between 6 small bowls. Dye each of the bowls of batter one color of the rainbow using food color. Fill each cup of the cupcake tin about ⅔ full. Bake for about 14 minutes or until a toothpick inserted into the center of the cake comes out without wet batter stuck to it. Do NOT over-bake. The cupcakes should not be browned at all. Once baked, allow them to cool on a cooling rack until completely cool. While the cupcakes cool, make the frosting. Place the butter and sugar in the bowl of a mixer fitted with a paddle attachment. Add the vanilla and milk. Beat until fluffy. To assemble the Cake Pops: Crumble the complety cooled cupcakes into fine crumbs, separating them into different bowls based on their color. There should be one bowl of red cupcake crumbs, one bowl of orange cupcake crumbs, etc. Place about 2 tsp of frosting in EACH bowl of cupcake crumbs. Mix until a clay-like texture is formed. Once all the cupcake crumbs are turned into clay, it's time to assemble the actual cake pops. Take a pinch of each color cupcake crumbs, and roll into a ball that's the size about the size of a golf ball. Place them on a sheet pan lined with parchment paper. Allow them to chill in the fridge for about 20 minutes. 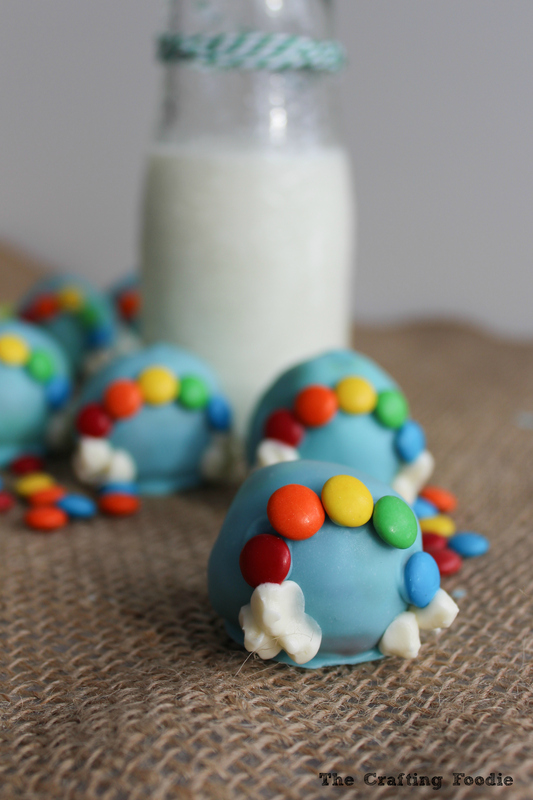 While the cake pops chill, separate the mini-M&M's into red, orange, yellow, green and blue. Melt the light blue candy coating with the shortening. Once the cake pops are chilled, I only take out 1 or 2 cake pops out of the refrigerator at a time. Working with 1 cake pop at a time, using a toothpick, dip the cake pop into the candy coating. Allow the excess candy to drip off of the cake pop. Place the cake pop on the sheet pan. If there's a hole left where the toothpick was inserted in the cake pop, cover it with a dollop of candy coating. While the candy coating is still wet, place the M&M's in rainbow order in a semi-circle to look like a rainbow. Allow the cake pop to sit on the sheet pan while repeating the same process with the rest of the cake balls. Place the dipped cake balls into the fridge to set for about 20 minutes. Once set, place the balance of the vanilla frosting in a zip top bag. Cut a hole in the corner of the bag. Then pipe clouds on either side of the M&M rainbow. The cupcake recipe is adapted from The Cupcake Project blog. 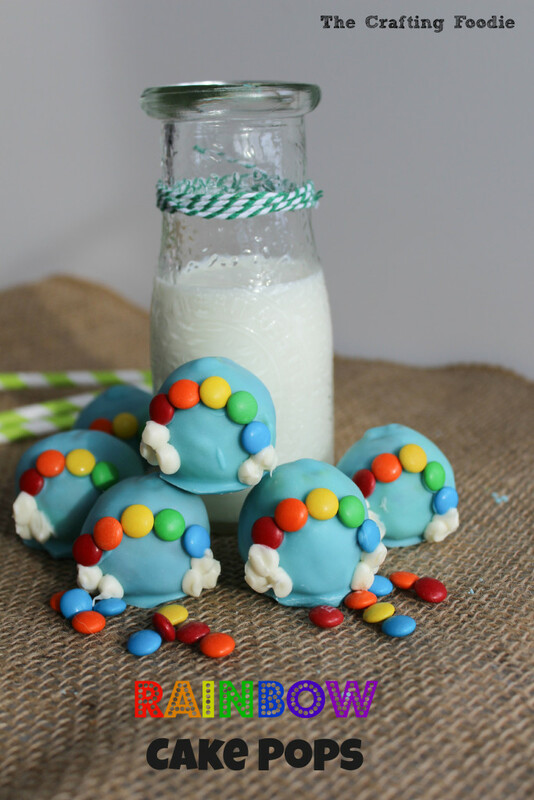 This post is linked to these awesome link parties. I loved the outside of these little cake pops, but then I came over and saw the inside!! Yes, rainbows make me happy! So creative, Aida. Pinning and shared on FB. As a homeschooling MoM I’m always on the prowl for new crafts. These would be perfect for my aspiring chef, she loves rainbows. Thanks for sharing! How fun is this?! WOW. So I love cake pops but everytime I make them, they aren’t very pretty. :/ This must have taken some patience to do. Thanks for sharing this recipe! Pinning and sharing. I would love if you linked this up to Totally Terrific Tuesday. Hope to see you there. Thanks so much Sheryl! 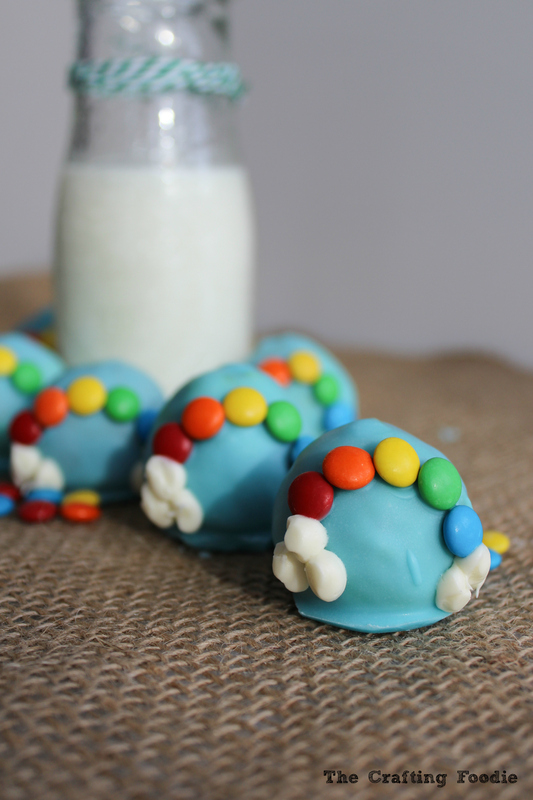 My 3 year old loved everything about them – the mini-M&M’s, the frosting clouds, and of course the rainbow cake inside! These are so creative and so beautifully done! You’ve got great cake pop making skills! Thanks so much Anita! Actually, my cake pop making skills are seriously lacking. They really intimidate me, but these ones were just to cute and fun to pass up! These are so happy and colorful! (: Wow, I have no idea if I could make these or not. Good work! Visiting from http://www.andieconn.com/colorful-mediterranean-edamame-salad-recipe-hearty-healthy/ and would love a visit back. Thanks so much, Andie! You can definitely make these. Cake pops, especially these ones, are actually pretty forgiving. Plus, it doesn’t matter how perfect they look because the rainbows on the outside and the inside are so distracting! These are so cute Aida! I love that they are rainbow in the inside too! Stopping by from Tips and Tricks and following you on Bloglovin! Thanks so much Raquel! You’re so sweet 🙂 I think we’re paired up for the blog hop, and I’m so excited to explore your blog! Oh my yumminess! These look so good. Thanks for linking to Tips & Tricks! I can’t wait to see what you link up next time. I pinned this to our Tips & Tricks board!